Eighteen-year-old Stephen’s dreams of continuing his education were shattered when he was sent to live with his aging grandmother on her farm after being relocated from one relative to another for years. He made impressive grades during his time in school that made him eligible to join a good secondary school, but was unable to pursue the opportunity further. Stephen has approached many government offices for financial aid to continue his schooling, but unfortunately has not heard back from any of them. Though Stephen has lost two years of schooling, he still hopes he will one day be able to join a secondary school. He has kept himself busy reading whatever he can get his hands on in order to keep learning in whatever way he can. He hopes to become a successful businessman in the future and be able to help his family out of poverty. After watching his extended family work extremely hard just to make ends meet, he is hopeful that he will be able to end the cycle of poverty in his family. Stephen is very sociable, and loves playing football. He is a member of his local football club, where he plays winger. He pours his heart into a small diary that he writes in daily, and plans to use the examples of his past hardships recorded in its pages to motivate and inspire future generations. He knows the value of hard work and has stayed engaged and active in not only his social life, but also his day labor work; he has managed to procure a day job to help his family on a weekly basis. His determination to do well in life is evident, and he manages to keep a smile on his face despite his situation. Stephen deserves a chance to put all his focus, determination, and hard work into something that will have a long-term impact on his future: his education. Help this brilliant, hardworking young man achieve his goals, and become his sponsor today! 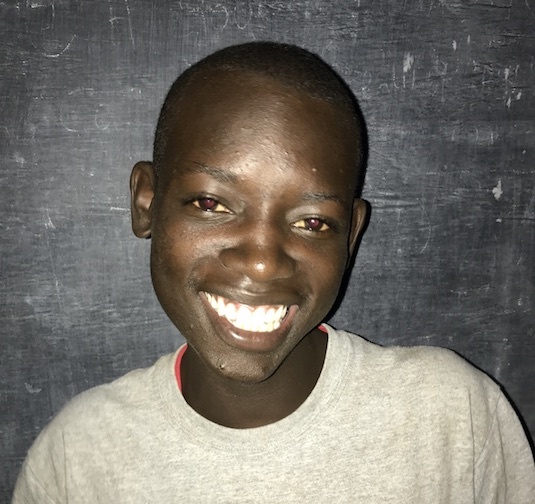 Sponsoring Stephen for secondary education is $75/month. Thank you for sponsoring Just One.